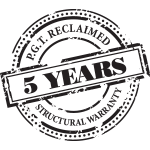 So that you can feel completely at ease, all our products come with a five year manufacturer’s structural warranty. This confirms our commitment to quality and our willingness to repair or replace, free of charge, any authentic PGT-RECLAIMED product which was sold to you from our authorised stockists. Please take a little time to read our “Assembly Instructions” and “Care Instructions” before starting assembly as any damage caused by improper use or handling or accident during the process is not covered by this warranty policy. We are confident that if you cherish your new PGT-RECLAIMED furniture from the moment you receive it you will be enjoying it for many years.